Sartorius is the longest muscle in the entire body, which crosses the front of the thigh obliquely from the lateral to the medial side. It appears from the anterior superior iliac spine and upper half of the notch immediately below it. The muscle corkscrew obliquely through the thigh from lateral to medial side to reach the posterior aspect of the medial condyle of femur, where its tendon runs forwards to be added into the upper part of the medial outermost layer of the shaft of tibia in front of the insertions of gracilis and semitendinosus. The insertion of sartorius is inverted hockey stick-shaped. It’s supplied by the anterior section of the femoral nerve. It bends both the hip and the knee joints, and adducts and rotates the thigh laterally to bring the lower limb into the sitting position of a tailor (Latin sartor: tailor)/” palthi position” embraced by Indian Hindus during meal. Which muscle is the longest in the entire body? 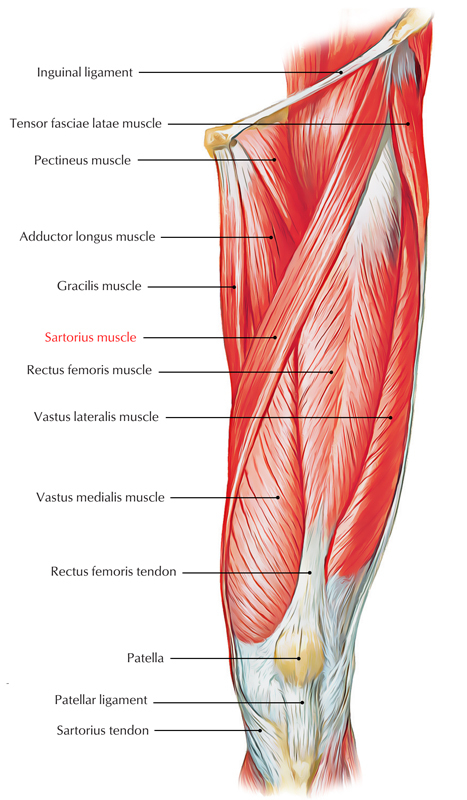 Which one of the following is the action of Sartorius muscle? Abduction of the hip joint. Extension of the knee joint. Pulls up the synovial membrane of the knee joint during its extension. Where does Sartorius muscle originate from ? Which nerve supplies the Sartorius muscle?